Join us today! We want to put a consultant in every market and small town across the country as soon as possible. Small Business Needs Our Help. What This Offering Will Do For You - Locate, analyze & evaluate small business clients in your area and help them become more profitable, get funding, sell their business etc. All forms are included to allow you to make large fees helping local businesses with the services they need and want. We are also available to you to help you through each deal. 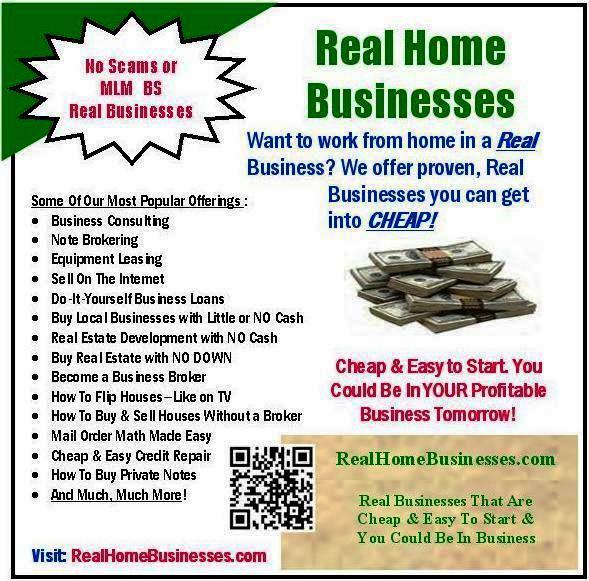 This is a business that can be run from your home. We are actively seeking Field Business Consultants to join us in the exciting field of Business Consulting. 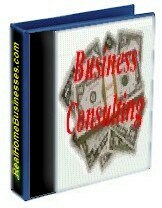 We will work with you and train you and do much of the work producing consulting products. We show you how to find the business clients in your area and what info to gather so we can produce the needed reports to accomplish the business owners goals. You send us the information we specify and we assemble the finished product send the finished product back to you for client presentation. You collect all fees and send us our portion along with the info we need to produce the product and you keep everything above our fee. It’s simple, you make great fees, you get paid first and we produce the products. What could be easier or more profitable? Some of our Field Business Consultants work part-time to supplement their income and others do this full time, the choice is yours and the pay is the say and there is never any quotas to meet or other criteria; you work when and how you want. In a nutshell. We show you how to get business clients. You meet with them, they tell you what they want to accomplish, we tell you what items to get from the owner, you send these items to us and we furnish what is needed and send it to you for client presentation. If questions arise, we are always available to answer your or their questions in a timely manner. The client pays you the fees, and you send us our portion along with the requested information and we send you back the finished product for client presentation. You always get paid first and we don't make money if you don't make money. This Small Business Offering Includes: (We Offer What Small Business Demands) It’s important to offer what the small business community and seeks the most. We work with business clients and other consultants across the USA. * Business Appraisals and Valuations – Disinterested 3d Party Expert Tells What’s That Business is Really Worth? We will show you how to meet with local business people and show them what we can do for them. You will gather the information we need to either do the analysis or in other ways work for the client. You will collect the fees from the business client and deduct your portion of the fee and send our portion to us along with the information gathered so we can start to work for your client. With many of our services you get paid first. With our appraisals, analysis and business plans; we will process the information and send the finished product back to you for final client presentation. Each of our offerings requires different material to be gathered but we will show you what we need and will always be available for contact via phone, e-mail, fax or US mail. You can make a good income helping local business people. 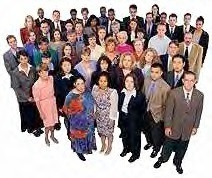 You will be the local "Go To Guy" for professional, affordable business services that all businesses need. All you have to do and be is presentable and confident that you can help them! There is no licensing that I know of to enter this business. Your Income Potential can be over $100,000 a year. You uncover the client’s need and we furnish all the reports to accomplish their goals. And remember, we will work with you on your deals to insure your success. * All Forms necessary to run this business including sample business cards, envelopes and stationary written in msPublisher.